One of the biggest joys of sharing An American Immersion while traveling or presenting, is connecting with people. These individuals are family, friends, colleagues, and acquaintances who either already love our waters or are introduced to the underwater world through my work. They enrich the story. So, here's a look at precious moments with some of the many special people that author Jennifer Idol has had the good fortune to connect with while sharing her story since the book was released. Join Jennifer at The Blue Wild Expo in Ft. Lauderdale, Florida April 22 and 23! Click Here to see Jennifer's full schedule of upcoming events. 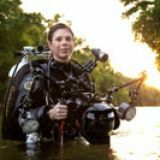 Jennifer became the first woman to dive all 50 states and designed a book that includes 561 of her images from the journey. An adventurer, entrepreneur, diver, author, photographer, and graphic designer, this multi-talented woman's message of environmental conservation is spreading across the country. Get your copy of Jennifer's book, An American Immersion and find your inspiration! The Physiology of the "Bends"